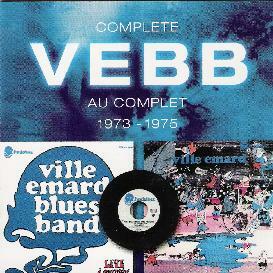 Ville Emard Blues Band - "Complete VEBB Au Complet 1973-1975"
Taking it's name from the Ville Emard district of Quebec, the Ville Emard Blues Band (VEBB) was formed as a cooperative in 1972 by bassist Bill Gagnon, and included upwards of 20+ musicians at any given time. This 2-CD set collects all the tracks from the Live á Montreal and Ville Emard albums from 1974 and ‘75, plus a bonus track and singles from 1973. All tracks except the bonus ("Vat'en Vite") were digitally remastered by Bill Gagnon. Throughout the Live á Montreal set VEBB treat us to heavy doses of 70's styled Funk, Rock, Jazz and Progressive rock, the percussion and horns often bringing to mind Rare Earth and the earliest Chicago albums. The band come roaring out of the starting gate with "Soumis", a tasty bit of jazz inspired progressive rock with a huge horn section, an excellent dual guitar sound, and Lise Cousineau's vocals sound like a French Chrissy Hynde. And from there they cover a great deal of musical territory. "Ville Emard Blues" is a short instrumental but features some great guitar interplay against a cool rolling bass driven melody. "Comme par Magie" has a 60's jazz sound I really enjoyed. Kind of like Claudine Longet gone prog-jazz. And "That Ain't No Way To Be" demonstrates what a head boppin' funky bunch of jazz-rockers VEBB can be. "Ode á une Belle Inconnue" is an interesting tune. It's a lovely concert piano piece. Orchestral... but a bit Richard Clayderman too. But it also has classic progressive elements. Strange contrasts. VEBB crank out their share of pop fluff too, as evidenced by songs like "A World Of Love". But again we've got a strange contrast because the keyboard sound on that song sounds like Tony Banks is sitting in. Yet as if they were only doing an obligatory hit during the live show, VEBB follow this song with what is easily my favorite track on disc one, the 9 minute instrumental "Kondy Donky". The band lay down a steady pounding bass and percussion groove, against which the horns, clavinette and guitar take off and jam. Nicely ripping jazz-rock. Fans of electric era Miles Davis will drool over this one. And VEBB follow this with a succession of songs that feature their instrumental prowess and hot jams. Off in very different territory is the acoustic country-folk song, "Indian Giver God", penned by VEBB guitarist Rawn Bankley. Where did this come from? It's a good song but totally out of whack with everything else. It's followed by another Bankley tune, "City Music", which is similar but more full band and Bluesy, kind of like Lyle Lovett. Interesting. But then as if to say, "Ok Rawn, we let you do your tunes. Now let's get back to business"... the band return to electric Miles territory and close out disc one with the intense free jazz number, "Poirots Névrosés". The first 24 minutes of disc two wraps up the live Montreal show, the highlight being the 12 minute funky prog-jazz jam rocker, "Strangle". I love the bit where Lise Cousineau does her Indian mantra chant while the band jam along in Funkland. Smokin!! And smokin' is exactly how I'd describe the better part of the set. Clearly an ensemble that thrives in a live environment. So how do the studio tracks that make up the rest of disc two compare? The Ville Emard studio set opens with "La Poutine á ma Tante Anna", an awesome jazz-rock tune with a progressive rock edge. This track makes a potent statement in less than 3 minutes. A real mind blower. But what the hell is this that comes next?! A light and fluffy piano and vocal song. Sharon Ryan's voice is from the heavens. No question about it. But I was expecting something with a bit more fire after that powerhouse opening. But not to worry... VEBB return to the land of prog jazzy funk and soul with the next track, "Affaire C.S.R. vs Marlyle Killer & Robert Ranley". Killer guitar! "Walter's Van" is like jazz-funk noir and definitely one of my favorites among the studio tracks. Equally compelling is "Guess Who's Coming To Jam", a fiery instrumental with phenomenal ivory tickling on the piano and a bass gone wild. Except for one more lulling fluffy song the remaining tracks are top notch and showcase a band exploring the possibilities of the stylistic concoctions they so clearly excel at. And the two songs from the 1973 single nicely round out this collection. But it's the live setting where VEBB were clearly at their best and shining like a supernova. For fans of 70's jazz-rock-funk-prog-pop, VEBB is a band that you will most certainly want to hear. Kudos to ProgQuebec for reissuing these recordings. For more information you can visit the Prog Quebec web site at: http://www.progquebec.com.